ScienceAtHome | Why students in the United States are playing Quantum Minds? Why students in the United States are playing Quantum Minds? The games at Science at Home are designed to enable citizens of various backgrounds, education, and ages to contribute to complex scientific research–in this case, building a Quantum Computer. However, that is not all–citizen science projects also have high educational potential. A few weeks ago we had a perfect opportunity to watch that educational potential become reality thanks to Janet, a Fulbright Fellow visiting researcher from the United States. Since she joined our team, Janet has been involved in a number of ScienceAtHome activities. While working with our games, she came up with the idea to contact her former professor at the University of Virginia, Chris Neu, and suggest that he incorporate our Quantum Minds (QM) game as an extra-credit task for his PHYS 1010 class. 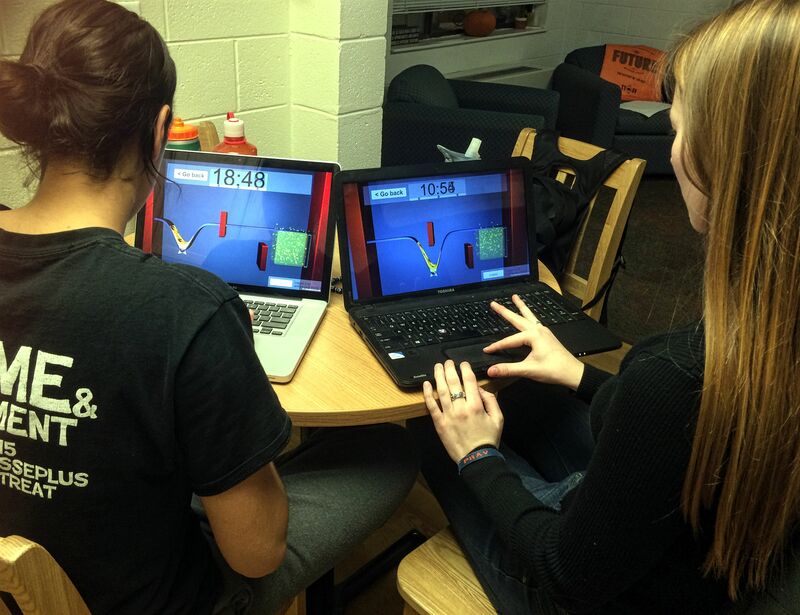 Motivated by scientific curiosity and the prospect of extra-credit, a class of 64 students played QM game 20 000 times! What is more, they did far better job than other players we have seen. Naturally, we were very inclined to know what their reactions about this extra credit task were. For this purpose, we got in touch with three of Professor Neu’s students: Sydney, Arden, and Sara. First of all, all three of the students we interviewed agreed that the game appeared deceptively easy. QM can appear easy at first, but it requires a smart strategy and some practicing. So, it was a well-earned credit! Another important question is, can playing QM help you learn? As Sydney puts it: “The game showed some of the characteristics of atoms that we learned in class, as well as how energy can affect its path of motion.” Thus, it fits well with a course laying the foundations of quantum physics. What is more, two out of three students agree that this homework was “instantly addicting”, which is not your usual description of a homework assignment. Finally, we asked them whether they would like to engage in similar tasks in other courses and we got three “YES”! “I would love to be able to learn through something that does not feel like homework“–Arden. It is great to see happy players, but what is, even more, rewarding is to see them learning and contributing to serious science. If you are a teacher and you are inspired to bring citizen science to your classroom too, just drop us a line and we will get in touch with you!